I have had the intention of creating this blog post for months as a follow up to 2014’s “On Being an Artist and a Mother” post. Penny’s second year of life has been vastly different from her first, and subsequently, my career as an artist has had to adjust along with her growth. Even writing this now, it’s very hard to follow up with Year Two as it’s been a huge blur, even moreso than the first year! I thought that the best way to tackle this is by going through photos from the last year to help me remember the challenges from each phase of Penny’s growth and how it affected my career. Life with a baby-almost-toddler was rough! Between 9-12 months, there were seemingly endless bouts of teething issues, waking up several times a night, and trying to appease a frustrated Penny that wasn’t yet walking, but wanted to be everywhere and do everything at once. Looking back now, I see how convenient it was that she wasn’t yet walking and still short enough that she wasn’t able to get into too much trouble while in my studio with me. I was able to paint in 30-45 minute bursts if she had enough toys to occupy her in my studio. At that time, I think she was down to two naps a day, each being about an hour and a half. Since I was getting so little sleep, I usually used the morning nap to catch up on sleep, and the afternoon nap to work. My mother-in-law would take Penny a couple times a week between naps so I could get a longer work day in. I tried pretty hard to find ways to get even 15-20 minutes of working time in while Penny was awake. I began to prioritize tasks based on the amount of focus needed while Penny was awake. Things like fulfilling shop orders, researching for a new piece, building photoshop mockups, social media and promotion, answering emails,and drafting a new piece were saved for when Penny was up and my full attention wasn’t really required. Being able to step away at a moment’s notice was key. 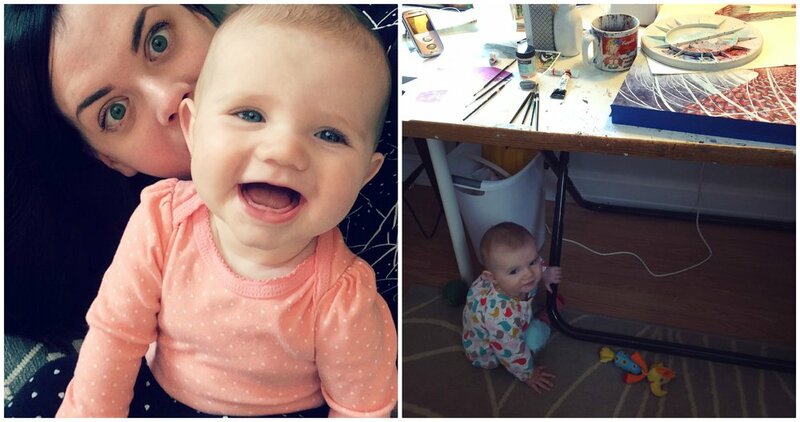 When Penny was napping, asleep at night, or with my MIL, that time was saved for painting. By this point, my process has changed A LOT, but I think my work has improved for it. My time management skills have been kicked into gear already, and each piece is heavily planned out so that little to no time is wasted. There were even a couple of instances in 2015 where I began a piece, didn’t like where it was going, tossed it and started all over. I didn’t consider it a waste of time because in the end, I was still going to get a piece I was proud of instead of a mediocre one, which would’ve truly been a waste, in my mind. When Penny was about 14-15 months old in late May, I decided to go to Spectrum Live in Kansas City. It would be my first time being away from Penny for more than a day. I had to take my breast pump with me as I was still nursing (we quit when she was 18 months), so that was a little cumbersome, but Penny was totally fine. She was used to drinking cow’s milk by this point and nursing was only supplemental and for comfort. The time away was incredibly refreshing, but I returned with greater focus on where to take my career, though with a deeper appreciation for these precious early years with Penny after speaking with a few veteran mom artists. I need to make it all count. Pressure’s on! Over the summer, Penny became more coordinated and was showing interest in coloring! I had long dreamt of the time when she’d be coloring or doing her own art projects in my studio while I painted. With a slightly longer attention span, I could finally get a little bit more work done during the day with her in my studio (as long as my supplies were even further pushed back). Penny was now down to a single nap lasting 1.5-2 hours, but my sleep had been improving at night so I no longer depended on using her nap to catch up on my own sleep (although I still sometimes do, as I’ll stay up pretty late working or suffer from insomnia from time to time). Around this time, a friend with a daughter Penny’s age told me about a wonderful lady with an in-home daycare I could afford, so Penny began staying there one day a week so I could have a full day of work instead of 3-4 hours at a time. This became a huuuuge relief, as around this time, I became incredibly busy with my work and I just couldn’t find enough hours in the day to paint. Some of my biggest struggles came to the fore during the second half of the year, around the time Penny reached 17-19 months of age. I was incredibly stressed by my workload (my own fault – I took on WAY more in 2015 than I should have), and dividing my time between being a career-driven artist and a stay-at-home mom (work-from-home mom?) became near impossible to navigate at times. If I was working, I felt like a bad mom. And if I was trying to make up for that by focusing more on Penny, I fell behind on work. Additionally, working from home is its own mess of challenges: you never truly stop working and yet, it’s remarkably easy to become distracted by the fact that your workplace is your home, and the bed is in the next room and if you could just catch 15 minutes of sleep, you could get more done later… and you see where this is going. These days, (Penny turns two in just 2 months!) I don’t even try to paint while she is up and roaming the house. She’s just too demanding of attention and too curious about everything to even take the risk of her messing up whatever I’m working on. If we’re in my studio while she’s up, I’m filling shop orders, cleaning the studio, or taking care of other menial tasks. To make up for that, Penny now goes to the in-home daycare twice a week, and my MIL takes her once or twice a week in the afternoons for a few hours. Additionally, if my super amaaaaaazing husband is home, he’s happy to keep her occupied for an hour or two so I can focus. With this new-ish setup, knowing I have two or three days of focused work time, I’m able to relax a little bit more on days when I’m Penny’s primary caretaker and give her my full attention. It’s probably also worth noting on those days, I try to pick up the slack on household chores as well (my husband is way better at this than me!). My goal for 2016 is to continue to seek a better work-life balance. Penny is already growing up too fast, and I don’t want to look back at this time with regret because I was too focused on my career or distracted by other things. My advice to other moms (or soon to be moms) about this second year in your child’s life: remember that everything is a phase – the good and the bad. And once you get used to a particular routine, enjoy it for another week or two, because it’s going to keep changing! This has been tough for me as a person who previously didn’t deal with change too well. If you can find time for yourself to relax every day (for me, it’s a bubble bath at the end of the day), please try to. Additionally, I know most of us artists don’t have tons of expendable income, so spending money on childcare can be difficult to reconcile, but my productivity and overall happiness has soared since taking Penny to her in-home daycare twice a week. It’s easy to become exhausted by your toddler when you’re with them 24/7! Because I’m producing more (and therefore making more money) with Penny gone twice a week, dropping her off at daycare pays for itself now. Plus, she’s spending time with other kids her age. Win-win! I’m both terribly anxious and terribly excited for this coming year with Penny. The “terrible twos” already seem to be upon us, with at least two or three tantrums a day over the silliest things. I know that this will be a very formative year for Penny’s personality, so I want to be as present and patient as possible with her growth, so my production as an artist may slow down a little. I should add that this couldn’t be at a better time, however. 2015 was a very successful year for me, especially monetarily. Going into 2016 seems to be looking the same, so I plan to coast on shop orders as much as possible as I work toward an exciting solo show this summer with a busy convention season in the fall. I really look forward to being able to “collaborate” on art projects as Penny grows with her motor skills and creative interests. So, bring it on, Terrible Twos! Thanks for tagging along and the continual encouragement! I also have to thank my husband profusely for being an amazing father to Penny and incredibly supportive of my career. I really couldn’t do this without him and I’m incredibly grateful for his partnership in this.